The NH Division of Travel and Tourism Development is all smiles&comma; with rosy winter travel projections. From left&comma; Jessyca Keeler&comma; executive director&comma; Ski NH; Taylor Caswell&comma; commissioner&comma; NHBEA; Manchester Mayor Joyce Craig and Victoria Cimino&comma; director&comma; DTTD. The New Hampshire Division of Travel and Tourism Development (DTTD) is anticipating more than 2.5 million overnight travelers will visit New Hampshire this winter spending more than $1.1 billion. DTTD’s winter travel projections mark approximately 3 percent increases in both visitation and spending compared to last winter. 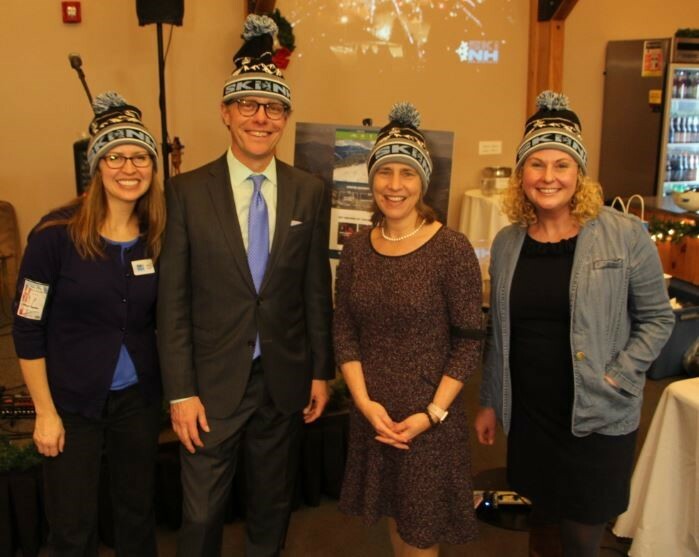 DTTD unveiled its winter marketing plan&comma; along with the forecast&comma; during a winter kickoff event hosted by Ski New Hampshire at McIntyre Ski Area in Manchester. Ski New Hampshire&comma; the organization that works to promote NH as the top ski destination in the region&comma; hosted its first Ski 603 Winter Kickoff event to showcase the Granite State’s variety of options for skiing and snowboarding. More than 20 New Hampshire resorts participated in the event&comma; which featured 14 New Hampshire breweries&comma; distilleries and wineries. For the 2019 winter season&comma; DTTD will continue to focus on markets in northeast Canada&comma; New York and the New England region. DTTD’s creative features skiing&comma; family fun and snowmobiling as core winter activities&comma; as well as après ski activities and off-slope adventures such as snowshoeing&comma; dining and shopping.